Religare Securities is one of the largest full service stock broker in India. 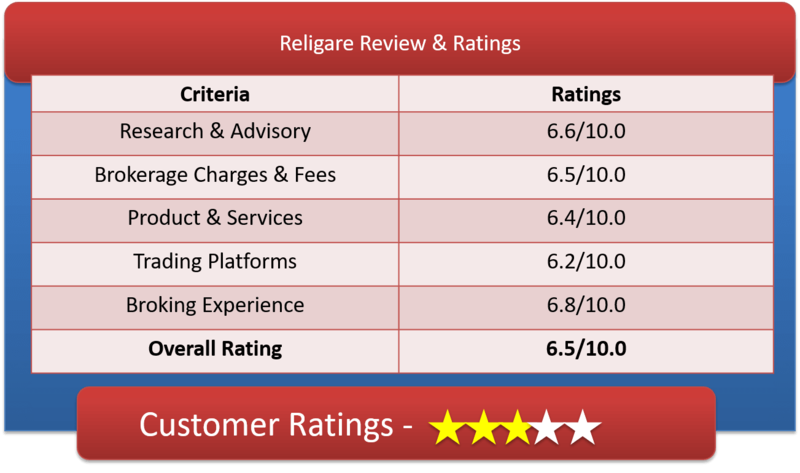 Let us run through a detailed understanding of Religare Review & Religare Demat Account. Religare Securities Ltd as a part of REL (Religare Enterprise Limited), is one of the leading multi-asset class retail broking and distribution platforms serving across India. The Broker has strong customer base of around 1 million and huge presence in about 500 cities of India. Religare is a member of major exchanges like the NSE, BSE, MCX-SX, USE and a depository participant (DP) with NSDL and CDSL. It offers facility to trade in Equity, Derivatives, Currency mutual Fund, bonds, IPOs and Commodity (through its subsidiary Religare Commodities Limited). RSL also offers TIN facilitation & PAN facility at select branches and works as NSDL-appointed enrolment agency for Aadhaar UID (Unique Identification Number) and an AMFI-registered mutual fund distributor which is unique among brokers. Trading with Religare can be done by using any of the folloeing ways: online, call n trade or by visiting your nearest branch. Here it is mandatory to have depository account along with trading account with Religare. The Broker has a team of professionals to support all customer queries over phone and Emails though mostly clients are not very satisfied with the overall customer service. Call n trade can be done by paying Rs 10 per call with maximum of Rs.50/- per day in a particular segment. Although this cost changes from time to time and also depends upon the amount of money invested/trading done. There is lots of flexibility and bargain on this counter. Equity- Smart investments in equity through intelligent tools like Portfolio Tracker and Smart Stock Screener. Exposure margin of 5 times initially and time value is 30 days with 18% ROI. Derivatives-POWER F&O from Religare is the next generation real-time (tick by tick streaming) price analytics & trading platform for traders. It provides reliable & quality information, visuals, heat-map, strategies, alerts and market data to help traders find the right opportunities for successful trading. Commodities- those trading in commodity must have account in Religare. We recommend Religare here. For heavy traders, Religare’s RIA platform offers streaming quotes to enable instant decision making. Mutual Fund- Through Religare’s platform, you can buy/sell any of the 5000+ available mutual fund schemes from more than 30 mutual fund houses without any extra cost incurred. Demat Account-Facility to avail life time AMC free account with Rs.2500 as one time AMC charges under BANDHAN GREEN plan. Again these charges are negotiable. So do go for a kill when it comes to bargain. Above brokerage charges levied by religare are for equity and these charges vary while trading in Commodity, currencies or derivatives. We found out that the brokerages offered are very much client specific. The more you trade the lesser the brokerages and vice versa. Demat account opening charge is Rs 500. But this amount is refundable in form of brokerage incurred within on- year period. Trading account opening is absolutely free. One good thing about Religare is that they don’t charge any account maintenance charge. Although these are the latest information available till date, these firms do change the price/fee/charges without prior notice. Auto generated watch-list for your deposit and holdings. Religare’s Smart Stock Screener, is an intelligent tool, allows you to define a set of criteria and parameters like minimum and maximum share price, dividend yield, PE ratio, etc. based on your investment strategy. Another tool called Religare Securities Smart Portfolio Tracker will help you Track the performance of your investments by calculating movements of your holdings. The online share trading web portal of Religare Securities which has the ability to work on slow internet speed as well. Powered by smart features like valuable and insightful research reports and advanced self-research tools like Star Ratings and Tech Scan is quite helpful. Religare Online also offers an exclusive research enabled trading platform for derivatives customers. Real-time (tick by tick streaming) price analytics & trading platform for traders in the Derivatives market. It provides high quality information, visuals, heat-map, strategies, alerts and market data making the trading experience smoother. A comprehensive trading software that can be downloaded on your desktop for trading in cash, derivatives, mutual funds, IPOs, currencies and commodities all in just one screen. It is power packed with useful features like advanced portfolio tracker, live market watch, stock screener, technical analysis of stocks and many more. Religare’s mobile trading app gives you freedom to trade anytime anywhere across Equities, Derivatives, Commodities & Currencies at your fingertips.